‘Ach, ich fühl’s’ (Pamina’s Act Two lament from The Magic Flute), the other Mozart selection, requires more inwardness and intensity. Although Coffey’s voice is not naturally muscular or aggressive, her upper register surges and expands impressively here, vividly communicating the character’s emotional desolation. 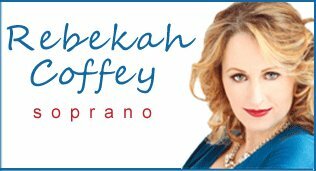 Coffey’s is a relatively light, lyrical soprano voice, at times almost soubrettish in quality: a perfect fit for Handel’s operatic music. Coffey confirms her affinity for this composer in fluidly dispatching the excitable coloratura passages in ‘Tornami a vagheggiar’ (from Alcina). The Belfast Telegraph June 2006. Rebekah Coffey & Clare Isdell, Music at Ten Series, Belfast Festival at Queens.